Used for stack cutting plywood or other thin wood. Holds wood layers together while you cut. 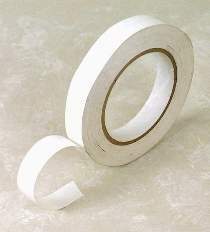 When you separate the layers, the tape peels off with little or no adhesive residue. For delicate pieces, apply a few drops of paint thinner with a foam brush and adhesive will release with ease. 3/4"W x 36 yards.